On a recent visit to ICALA (Insitute of Contemporary Art in Los Angeles), I had the unique opportunity to speak at length with Gabriela Ruiz (aka Leather Papi), one of the many amazing artists participating in Rafa Esparza: De La Calle. A collaborative space that emerged at ICALA by which artist Rafa Esparza questioned the centrality of artistic authorship while ceding space and resources to invited artists and cultural producers alike (ICALA). Produced in collaboration with Victor Barragan, Josh Castillo, Amina Cruz, Fabian Guerrero, Sebastian Hernandez, Young Joon Kwak, Dorian Ulises Lopez, Tanya Melendez, Olima, and Leather Papi (Gabriela Ruiz). Having the privilege to visit a museum in the middle of the day means I get to experience the space almost exclusively by myself, with no crowds. During my initial visit, it was the former director of a museum in town, three other white male guests, and I, oddly enough none of the gentlemen walked in the project room. Inside it, however, I found Gabriela Ruiz setting up garments on a mannequin. 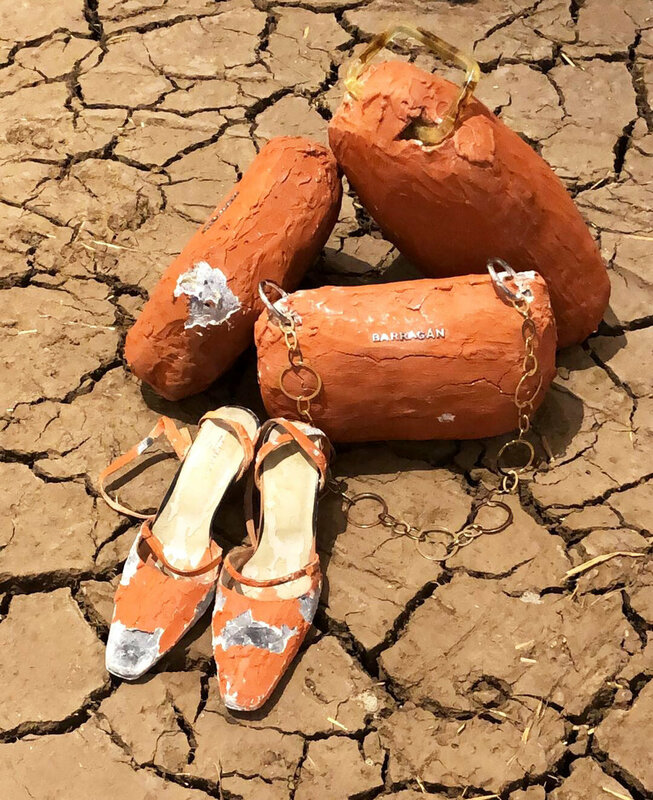 We quickly bonded over the project and the art world, as we spoke of the Avant-Garde Fashion Show which took place in Los Callejones (Santee Ally) of Los Angeles earlier during the exhibition, coined "Surreal Art Parade" by Carolina Miranda. I had seen and read everything I could get my hands on about the Avant-Garde Fashion Show, as I was out of town the day it took place, and quickly became fascinated by the garments, the location, the experience, etc. So I asked Gabriela, why Los Callejones? she responded that this was Rafa's idea, that the goal was to inhabit a space that is of true importance to the Latinx experience in Los Angeles. De La Calle, thus created two very unique things simultaneously; a safe space inside a white cube to acknowledge Latinx reality and the migration of said subjectivity into a predominantly Latinx space. As I wandered around the project room at ICALA while speaking to Gabriela I could not help but think about the complexity of De La Calle. 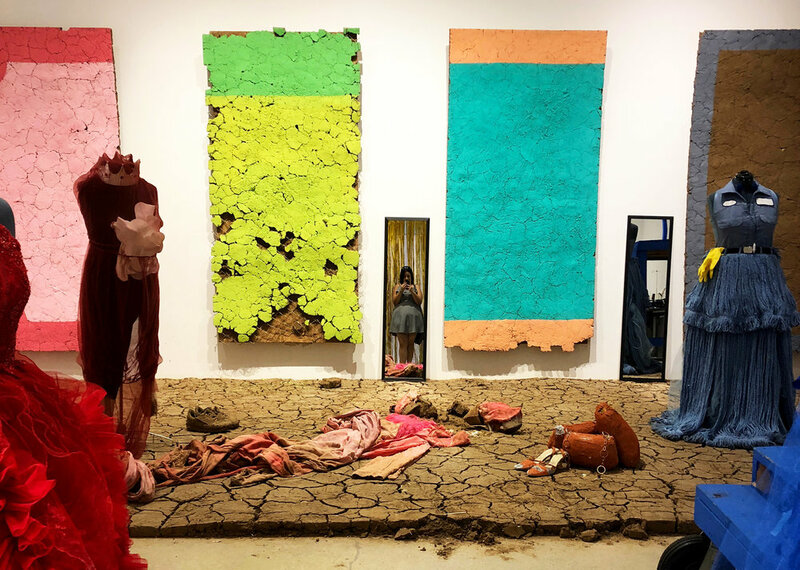 This project space did feel other even within the museum walls; the dirt on the floor, garments thrown everywhere, shoes being turned into eagles, an iron, empty soda cans, and elaborate dresses made of mops paired with cleaning gloves. So even inside ICALA, De la Calle was challenging its location, its guests, etc. I mean, not even the former Director of another museum stepped inside. While speaking to Ruiz she explained that the closing portion of the Avant-Garde fashion show was censored as Los Callejones are in fact privately owned and have their own security personnel, thus Cruz Azul was not a part of the offsite experience. This simple fact translated to ICALA hosting Gabriela Ruiz’ performance inside its own walls, and "Cruz Azul" became the closing event for De La Calle. So then who owns contemporary art? (Note that in this case, I speak of ownership free of capitalist agendas). Let's recap; Rafa and team decide to make fine art, and to take the performative aspect of the same outside of the institution, giving art directly to people outside of the white space, making the witnesses of said experience the legitimate owners of the artwork itself; of sorts that is, how much can one really own a performance? Yet still defining space and typical audience engagement probabilities, the group opted not to overly publicize this occurrence in an effort to maintain this as true to the offsite location as possible. But then the work gets censored, thus an exterior force outside of the immediate public of the work negates their enjoyment of the said action, and in turn their ownership. Further, the institution reacts by cannibalizing this exterior occurrence only to bring it back inside the safety of its white walls. Yet, the performative aspect itself was designed by a group of artists questioning authorship and inadvertently questioning institutional canons, and intrinsically negating the existence of the same inside an institution. So then something born inside a white space made to inhabit a different reality, then had to be modified to fit back into the institutional walls, therefore negating the original intent of the work itself. Thus I wonder who owns it? I witnessed the closing performance by Leather Papi (Aka Gabriela Ruiz), at ICALA. I was surrounded by artists, friends, and colleagues, and after the performance, we all discussed how lucky we were that we were able to witness this portion of it, since the original display was, in fact, negating our ownership/enjoyment of said work. Not that we were happy in any way that the performance was censored outside of the institution, but we were rejoicing about how the institution provided us with a space to witness this creation. But the work was not meant for us, not for this space, not for the institution, not for me. Thus I am left wondering how the work offsite would have affected me? 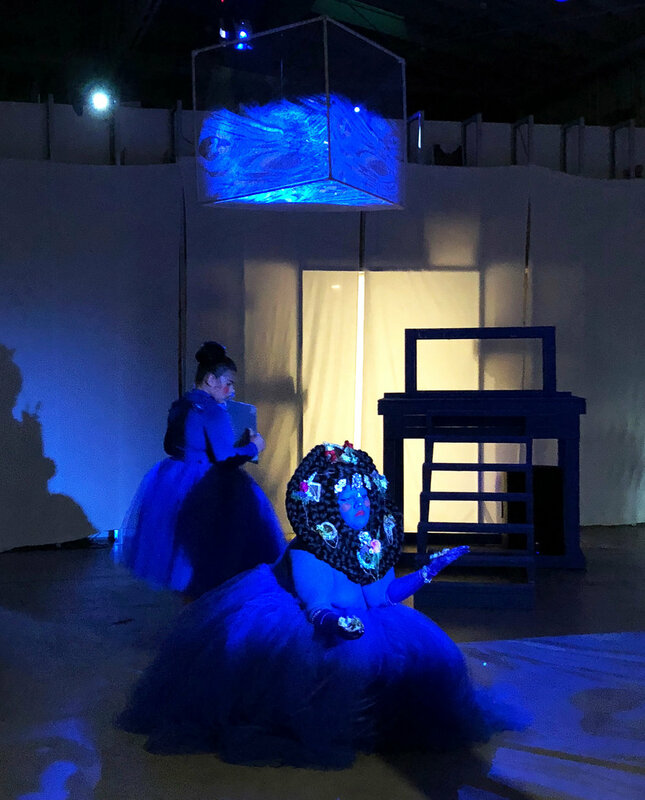 Cruz Azul by Leather Papi was an amazing and truly challenging conceptual performance, which mixed raw emotion, with sophisticated technology that left me wondering about the iconography used to allow me to emote freely under such spatial restrictions. And as soon as I articulated this to myself, I wondered if this reaction is even a fair assessment, the work after all was meant to be seen in another place, by people who care not about aesthetics as much as I do. In this particular case, my privileged understanding of artistic canons is fighting with my Latinx need to have seen this at Los Callejones, had I been shopping that day, what would have I experienced? How would Cruz Azul allowed me to claim ownership? to own it? If truly exceptional art, such as Cruz Azul and the Avant-Gard offsite fashion show is meant to be consumed outside of a space of aesthetic priviledge, then the new consumer becomes the everyday person, not the overly sophisticated art connoisseur. If the work is meant to be owned and enjoyed by people outside of white spaces, then why does the Institution feel the need to colonize ownership of the same to feed it to a different audience altogether? Would a better choice not have been to ask permission to the offsite location? I for one am truly aware of my privilege in the art world, the same that negates comfortable enjoyment of POC inside white spaces, the same that requests I behave a certain way inside those walls. But I am also very grateful that projects like De La Calle, artists like Rafa Esparza, Gabriela Ruiz and team, and curators like Jamillah James at ICALA are at the forefront of challenging art historical canons to grant accessibility into these spaces for people like me, to have conversations like this one.